2011 was Rabindranath Tagore's 10th birth anniversary. What better way to begin 2012 than to remember him and honor his works. Through the next few weeks Suprose will be posting a few pieces in memory of this iconic artist and writer. Rabindranath Tagore (1861-1941) is one of the most revered and talented writers and artists that India has produced. The first Asian Nobel Laureate to win the Nobel Prize for Literature in 1913 for ‘Geetanjali’, a compilation of some of his poems. He was not only a poet but truly a multifaceted genius – a Writer, Painter, Philosopher, Educator, Businessman, Social Reformer and advocate of Indian Independence. He has composed over 2000+ songs popularlycalled ‘Rabindra-Sangeet’ (Tagore’s Songs) which still continue to top the charts. He is the only composer and lyricist in the world whose compositions are used as the National Anthems of 2 different nations, India and Bangladesh. 2011 is the 150th anniversary of his birth and it seems fitting to honor him and his work. From time to time he participated in the Indian nationalist movement, though in his own non-sentimental and visionary way; and Gandhi, the political father of modern India, was his devoted friend. 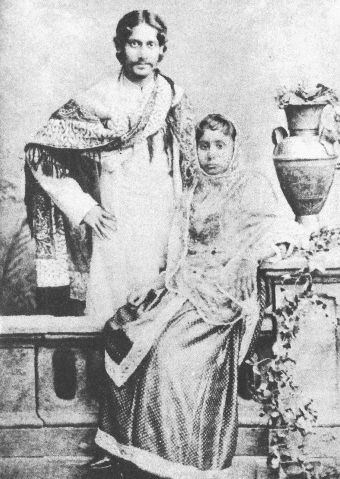 Tagore was knighted by the ruling British Government in 1915, but within a few years he resigned the honour as a protest against British policies in India. Although Tagore wrote successfully in all literary genres, he was first of all a poet. Among his fifty and odd volumes of poetry are Manasi (1890) [The Ideal One], Sonar Tari (1894) [The Golden Boat], Gitanjali (1910) [Song Offerings], Gitimalya (1914) [Wreath of Songs], and Balaka(1916) [The Flight of Cranes]. The English renderings of his poetry, which include The Gardener (1913), Fruit-Gathering (1916), and The Fugitive (1921), do not generally correspond to particular volumes in the original Bengali; and in spite of its title, Gitanjali: Song Offerings(1912), the most acclaimed of them, contains poems from other works besides its namesake. Tagore's major plays are Raja (1910) [The King of the Dark Chamber], Dakghar (1912) [The Post Office], Achalayatan (1912) [The Immovable], Muktadhara (1922) [The Waterfall], andRaktakaravi (1926) [Red Oleanders]. He is the author of several volumes of short stories and a number of novels, among them Gora (1910), Ghare-Baire (1916) [The Home and the World], and Yogayog (1929) [Crosscurrents]. Besides these, he wrote musical dramas, dance dramas, essays of all types, travel diaries, and two autobiographies, one in his middle years and the other shortly before his death in 1941. Tagore also left numerous drawings and paintings, and songs for which he wrote the music himself. Suprose will be blogging several posts honoring Tagore, you can see all of them by clicking on the label Tagore.